Even though we do it every year without fail, gift wrapping may just be one of the most overlooked design choices of the entire holiday season. Thinking about it, it's an oversight that makes complete sense. This time of year is rife with design choices, all of them competing to be the biggest statement in our decor. How big will we go in decorating our tree? What will be the centerpiece of our holiday dinner table? How will the stocking arrangement on this year's mantle top what we did last year? Any of these questions would seem to demand more time and energy than we would usually put into choosing wrapping paper. But design isn't just about the big moments. The little things that count just as much and most times it's just those tiny details that end up bringing everything together to create the moments that stay with us long after the decorations have come down. And though it's destined to be discarded at some point, (and likely in many small, shredded pieces) the wrapping we use to decorate our gifts, just like the decoration we put on the tree, the table and the mantle, is a sign of the care we take in every part of the holiday and every aspect of the giving process. So here's 15 of our favorite modern ways to show the people you love how much you care before they even open the gift. Stripes are one of the oldest patterns in existence, having been around since the dawn of human creativity. So there's every reason to believe that it was probably one of the first wrapping paper designs as well. The great thing about stripes is that they're so versatile, so universal, that they never really go out of style. They just require a little update from time to time. With that in mind, we'll begin our survey of modern gift wrappings by taking a slightly different angle on the usual strips pattern. The simple combination of thick stripes with a diagonal angle and the a color palette of black and gold gives this wrapping paper from The Ace Hotel a sophisticated, upscale look that will have anyone you present them to eager to find out what's inside. Geometrics have been gaining in popularity for some time, appearing in many of our favorite home textile patterns. 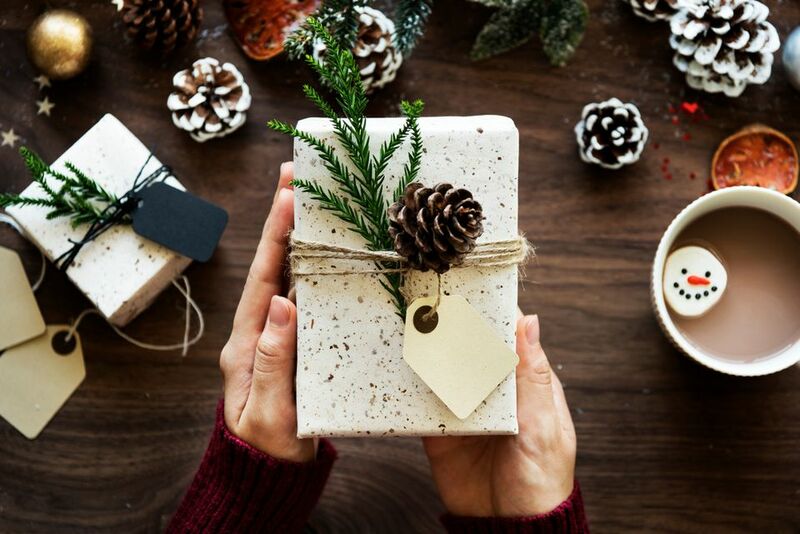 So it's not surprising to see them making a splash around holiday time, giving us some truly intriguing possibilities for wrapping gifts as well. 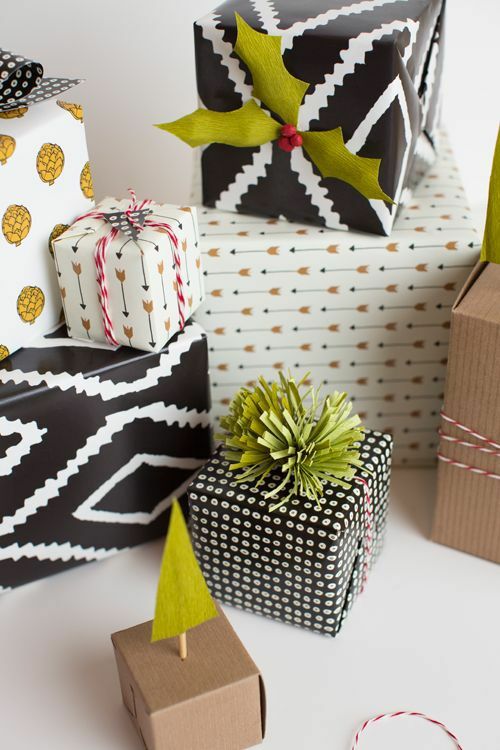 For these presents, a few geometric designs are all it takes to bring instant visual interest to what would otherwise be a plain brown wrapping paper with thin stripes. Instead the pattens make a beautiful statement without being too busy. If you're the sort of person who's waited years to use the word sprig in a sentence, then this is definitely the modern wrapping method for you. This strikingly understated wrap forgoes the typical bright colors and dazzling patterns for something a little more complex, using a plain brown paper and thick, black ribbon as the perfect backdrop for a sprig of pine for the ultimate note of holiday spirit. The time and care that it takes to go through all of the steps that wrapping a present like this requires is a wonderful way to show that the gift that you're giving is from the heart. There's just something so stylish about keeping it simple. Sometimes the lack of ostentation can say so much more than things that shine brighter or try harder. The perfect gift giving example of this idea comes in the form of this super-chic matte black wrapping paper. And if you really enjoyed the sprig idea, the flat black backdrop that this paper provides is the perfect showcase for a sprig of mistletoe with white berries. From designing runway fashions to decorating rooms, skillfully mixing patterns is one of the most advanced design abilities that anyone can have. That idea applies to wrapping Christmas presents as well as we see in this beautifully modern approach that gets it just right. With just a little patterned tape you can make a plain brown paper wrapper into the first gift they'll want to open. Chevron is another classic pattern with roots deep in antiquity. To give it a more contemporary flavor this paper plays with scale, using small, disconnected bars to create the chevron effect. At the same time, the slight, though clearly intentional, imperfections in the pattern give the paper a slightly handmade, global feel. Combined with a stylish black ribbon and a faux sprig tag, this is one gift wrapping approach with layers upon layers of things to love. If you're looking for a versatile, customizable wrapping paper that will also let you engage your creative side to make sure that everyone on your list gets something unique, then chalkboard paper might be just the thing for you this holiday season. This paper is perfect for artists, DIY enthusiasts or anyone who has the skills to turn their holiday gift wrapping into a canvas for showing the people that they share the holidays with just how much they really care. The polka dot motif has been around for a long time. For a lot of other patterns that might lead to us getting bored with it, but one of the things that keeps polka dots perpetually at the top of the design list - particularly with regard to holiday gift wrapping - is the ease with which this pattern can be updated and tweaked. In this case, replacing the traditional dots with stars keeps the appeal of the basic pattern while giving a longstanding idea a brand new look and feel. Here's an even more interesting take on polka dots for holiday gift wrapping. This one takes the traditional design to new places by replacing the dots with cookie cutter-style line drawings of iconic holiday elements such as trees, stars, and gingerbread men. The mix of different shapes and sizes gives the design a slightly asymmetrical look which takes it even further away from the structured look of traditional polka dots. All in all, this is a fun new way to do dots, one that we'll undoubtedly see more variations on in the years to come. Of course, if there's one thing we've learned from stripes and chevrons, it's that a classic never really goes out of style. While there are tons of ways to update polka dots, there's still plenty of reasons to love the original. And again we see the super-modern black and gold color palette being used for a sleek, contemporary look. One of the coolest new trends in holiday wrapping is to cover your gifts in actual fabric. This beauty of this idea is that it not only gives your gifts an instant jolt of color and pattern, it also gives them a unique texture that's sure to make them stand out under the tree. And for those of us who don't always enjoy the experience of wrapping paper, using an easy-to-fold fabric like cotton or linen might just make the experience a bit faster and easier. And because it won't get shredded during the opening process in the way that traditional wrapping paper will, fabric wrappings can be saved as keepsakes, framed as art or even used in a future DIY project. Of course, not every gift gets wrapped for the holidays. Gift bags have long been a stylish alternative to wrapping presents. But even if the gift bag is your preferred way to package your holiday offerings, there's still a variety of ways to bring a creative spark to your gift that your friends and family will remember (perhaps even longer than the gift itself). Here, an ordinary lunch bag finds a higher calling as gift wrapping. Complemented by simple twine and paired with a sprig of pine, this understated, rustic gift wrap is the ideal way to give gifts to anyone in your life who appreciates the simpler things. Metallics are one of the classic staples of decorating for the winter holidays. They appear on trees, mantles, and holiday dinner tables all over the world, and they're no stranger to wrapping gifts either. The modern approach to wrapping with metallics keeps things low key. The silvers and golds aren't too bright, the patterns aren't too busy and the soft shimmer of copper paper, such as that seen here, is allowed to speak for itself without too much additional help. What assistance it does receive is substantial however, being delivered by basic polka dot patterns, simple ribbon ties and even a faux pine sprig. Just like a paper decorated in stripes or matte black, this paper has a straightforward and uncomplicated appeal that makes it feel very grown up. If you're wrapping presents for the Christmas holiday, there's no reason not to embrace the full joy of the season by decorating your gifts with some of the iconic images of the season. This updated polka dot pattern features small trees in place of dots for a little extra yuletide fun. Add a bit of real tree to complement your illustrated ones and tie it all up with a bit of twine. What more could you need for a very merry Christmas?